With wins here at the April race, then in Colorado, Alberta and Montana he clearly dominated Pro Stock in 2016. In the final round Vollmer ran 7.547 at 184.57 mph to end the season on a high note. 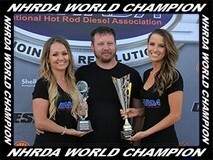 He thanked G&J Diesel for the chance to drive the 1941 Willys during the 2016 NHRDA season.